Last year our city was graced with another music festival geared toward the dad-music lovers in all of us. 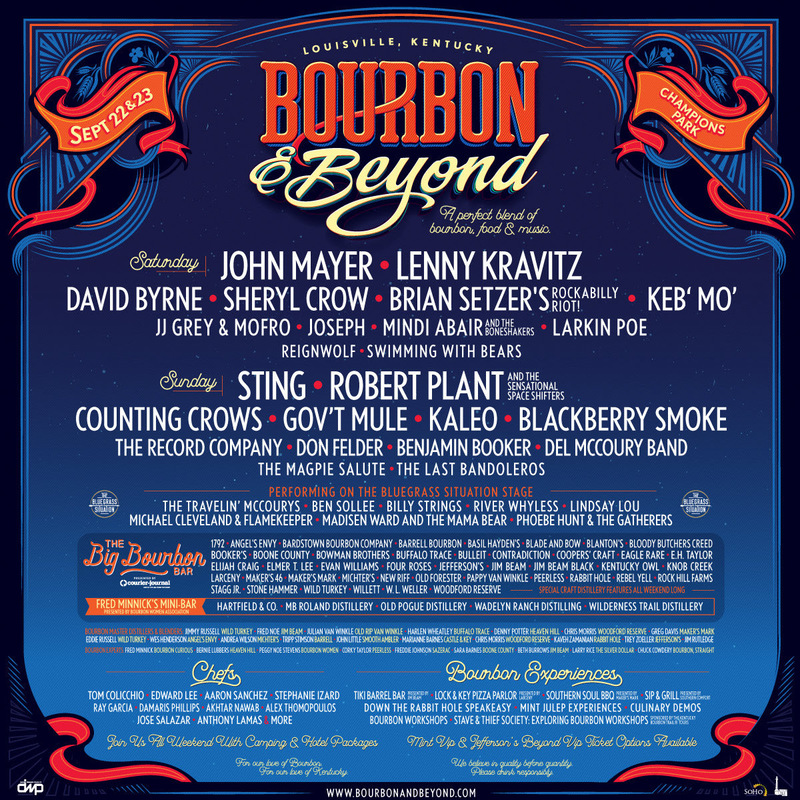 Memba the 2017 Bourbon & Beyond? Yeah, so do we… For a first year festival, on paper it went well: gorgeous weather, solid bands, delicious food/bourbon options, and a load of people. We noted some things that could stand to be improved, but overall, the experience was a positive one for us. This year’s lineup is fun and includes some legendary names that we have never really seen. To help y’all, we’ve made a special preview for B&B V.2. Cheers and see you this weekend! Know where the best bathrooms are, plan out your entrance/exit, and locate the water station. This applies to any festival really. Take note, however, the VIP areas have changed and there is no true third stage this year; instead there are a couple of smaller tents. Nevertheless, there are a number of themed bar/restaurant areas that you should definitely be aware of and plan on checking out. Take a look at both days’ schedules and decide where you want to be and when. The music piece is pretty easy, as the stages are right next to each other, so you can almost stay put and see the entire thing. [TAKE NOTE: a lot of folks will bring chairs and do exactly that, post up in one spot. So if you are trying to maneuver around, be ready to dodge people and their set ups.] There are also a bunch of other events occurring throughout the day, including bourbon, and industry talks, as well as demos and tasting from chefs. This festival is truly all encompassing, and I’m sure some people come for the bourbon and food aspect over the actual music. Nevertheless, if you are interested in any other entertainment, or want to grab some shade at some point during your day, find some tent activity that will meet your needs. Check out the full schedule here or download the app! Once you enter the grounds, you are in for the day – unless you are camping, there is no re-entry. Only certain types of bags are allowed. You can bring a chair, but some will be turned away. The list of prohibited items is pretty long, so check the website before packing for your day. You don’t want to be forced into leaving things outside, walking back to your car, or running home with something that isn’t allowed… that would be a cruddy start to your fest. If you ever need a break from the crowds or elements, head to the Bluegrass Situation Stage (which actually is in a tent, we think) for good ol’ Kentucky music. The only local bands (Ben Sollee and Michael Cleveland & Flamekeeper) will be in here playing all of the strings for you. Our girls from Joseph are back in town again, and their early Saturday time slot will help you get into full festival mode. Considering the lack of ladies last year, we’re excited to see an increase on this year’s lineup. On Saturday you can also catch Larkin Poe, Lindsay Lou, Phoebe Hunt, and of course, Sheryl. Sunday has fewer to choose from, but Halli Anderson and River Whyless is one to keep on your radar. A staple of the 90s and 2000s, Counting Crows are on their ’25 Years and Counting’ tour and I have a feeling there will be a lot of jamming and a lot of singing along from the audience. You can argue that they have some cheesy hits (and you’d be right), but I anticipate this set will be a fun one. Let me start with this: I am so excited to see David Byrne in person. Even with all the hype around his American Utopia album and accompanying tour, I am so confident that I will be blown away by the inventive artist. I predict an equal combination of dancing and ogling in awe at everything he does. You may make fun of him for a second. It is okay… he did some really poppy fluff when he was a young man that hasn’t necessarily aged well. But then he went and had all kinds of voice trauma, dated/broke up with some people, and toured with the Grateful Dead guys (aka Dead and Co.), coming out on the other side a hardened man. Throughout his career fluctuations, he has remained a pretty adept guitarist and considering how hot ‘noodling’ was at last years B&B, we expect John Mayer to give the crowd exactly what they want. I know Robert Plant was here for Forecastle several years back, but I don’t think 23 year old me was fully ready to appreciate what I witnessed. ALAS, I AM READY NOW. We have new music from Plant, however, with a career as long as his, we should hear music spanning the decades. He is exactly what a Sunday evening deserves. Have you all heard that she recently released a song with St. Vincent? If Annie were to make a guest appearance at B&B and we could witness these two ferocious babes on stage, that would be magnificent. If not, all of the dads in the audience will still be so happy to see her. If you want a good viewing spot, I’d suggest sidling up there early on.